Providing you the best range of used machinery cnc punch press, gas cylinder enclosure, industrial gas cylinder enclosure and stainless steel gas cylinder enclosure with effective & timely delivery. CNC single Station Punch Press 1250 x 2500 sheet with reposition. Hindustan Hydraulics make 20 Ton 6 years running. 200 tools approximate. With PC and DNC software programming (Direct program from DXF file. Hydraulic oil filled and servo stabilizer equipped. We are successfully ranked amongst the trustworthy entities offering a wide range of Gas Cylinder Enclosure. Obtainable in diverse finishes, designs and patterns, the offered enclosure is highly demanded in the hospitality sector. 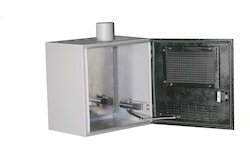 The offered enclosure is designed manufactured by our talented professionals using precision engineering with the help of latest techniques. This enclosure provides comfortable operation and storing in various places. Additionally, our clients can avail the offered enclosure from us at the most negotiable rates. As one of the leading entity of this domain, we are engrossed in providing supreme quality of Modular Gas Cylinder Enclosure. Available in the gradation of designs and patterns, this enclosure is widely demanded in various domestic and commercial areas. 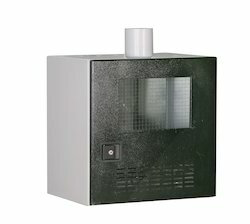 The offered enclosure is designed and manufactured using the best steel boards, and light tiles with the help of cutting edge techniques under the direction of our professionals. Also, our clients can get the enclosure installed at industry leading prices. Within the short time period, we are engaged in presenting an excellent grade of Industrial Gas Cylinder Enclosure. The offered enclosure is designed and manufactured using steel sheets and platforms at our hi-tech designing unit by our hard-working professionals. 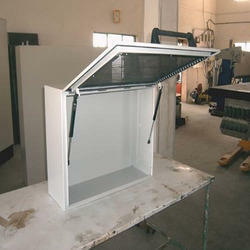 This enclosure is mainly used domestic, commercial and industrial sectors. Besides this, our patrons can avail the offered enclosure in various designs at marginal rates. Since our inception, we are engaged in presenting a wide range of excellent quality of Stainless Steel Gas Cylinder Enclosure. 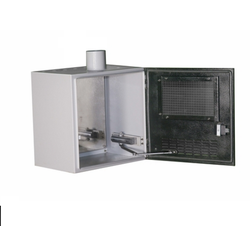 The offered enclosure is designed and fabricated with the use of asbestos sheet, aluminium, steel and other materials by our skilled professionals as per the IEC 529 and BC5490 standards and can provide protection up to IP 55-67 norms. This enclosure is used in a variety of commercial and residential sectors. Furthermore, our esteemed clients can install enclosure at the most negotiable prices from us. Standard width 400 mm ~1500 mm in pitch of 100 mm. Standard depth 400 mm ~ 600 mm in pitch of 50 mm. Standard height 500 mm ~ 2000 mm in pitch of 100 mm. 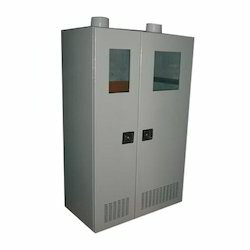 We provide a superior range of Gas Cylinder Enclosure in various sizes. Our products are available in various quantities to meet the several requirements of our clients. We ensure the most advanced and reliable products which are easy to use, portable and profitable in price. Air suction duct at the top for disposal of gas leakages. Width and depth adjustable cylinder mounting channels on a 25mm pitch. Fire retardant & chemical resistant Polyurethane foamed D type gaskets (workability at 100ºC temperature) on doors. Wire reinforced toughened glass fitted on doors with support channels (plated or powder coated) screwed on the doors. Doors with hydraulic power closers keep door normally closed with a push to open single point lock. Heavy 5.00 mm thick unfolded plate used as a bottom for more strength and easy cylinder placing inside the cabinet. Eye bolts are fitted in depth angles firmly welded to its body from front to back. Thus the main load is transferred to lifting hooks directly and not through panel body. Looking for Gas Cylinder Enclosure ?